^ Schmitz, Barbara (2010). "Holofernes's Canopy in the Septuagint". In Kevin R. Brine, Elena Ciletti and Henrike Lähnemann (ed.). The Sword of Judith. Judith Studies across the Disciplines. Open Book Publishers. ISBN 978-1-906924-15-7. ^ a b c d e f Deborah Levine Gera (2010). Kevin R. Brine; et al. (eds.). The Sword of Judith: Judith Studies Across the Disciplines. Open Book Publishers. pp. 29–36. ISBN 9781906924157. Herbermann, Charles, ed. (1913). "Book of Judith" . Catholic Encyclopedia. New York: Robert Appleton Company. : Canonicity: "..."the Synod of Nicaea is said to have accounted it as Sacred Scripture" (Praef. in Lib.). It is true that no such declaration is to be found in the Canons of Nicaea, and it is uncertain whether St. Jerome is referring to the use made of the book in the discussions of the council, or whether he was misled by some spurious canons attributed to that council"
^ Christiansen, Ellen Juhl (2009). Xeravits, Géza (ed.). 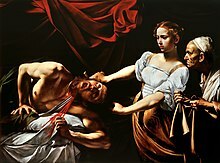 "Judith: Defender of Israel Preserver of the Temple" In A Pious Seductress: Studies in the Book of Judith. Walter de Gruyter. p. 75. ISBN 9783110279948.